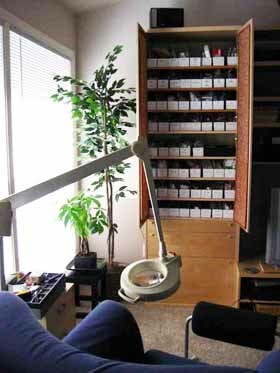 Bead storage systems can be a highly personal matter, but there are some common wishes for storage solutions. These include ease of use, ability to inspire us, efficiency in terms of space, and low cost. If you have a lot of beads, it is unlikely that any one systems will satisfy all of these criteria, but you get to decide which factors are most important. 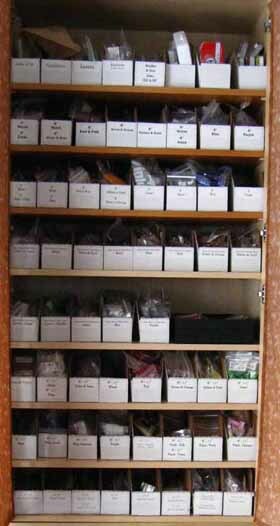 I have seen pictures of gorgeous bead storage solutions such as a wall of hooks holding skeins of Czech seed beads, or towers of crystal clear plastic containers on shallow shelves, so every color is visible. I drool over such systems. My own bead storage solution required something a little different. I need to fit as many beads as possible into a smallish space. So I use the zipper bags method. I used to have the bags of beads in plastic shoe boxes, stacked two deep, on shelves in my laundry room. I learned that closed boxes, especially closed boxes stacked two deep could seem like too much of a hassle at times. Sure, I was sufficiently motivated to get beads out of the boxes when I wanted them, but not energetic enough to put the beads away when I was finished with them. Bags of beads kind piled up on the countertop beneath the open shelves. My working space disappeared under the pile of bags. . . So I replaced the shoe boxes with corrugated cardboard bin boxes, only 3 inches wide, 12 inches long and 4.5 inches tall, and open on top. I rearranged the shelving to have only one layer of boxes per shelf. Now it is easy to just toss, shove, or stuff bags back into their boxes. I have set up my boxes by bead size and color. Each color group has a box for size 6, a box for size 8, a box for sizes 9-11, a box for sizes 13-15, a box for delicas, and a box for larger (not seed) beads. There are some additional boxes for other bits in my collection: flower and leaf beads, for example, or cabs and pendants. Now I have graduated from the laundry room to the living room and I have a very functional storage unit that I bought from Ikea. Yes, my Very Own Bead Cabinet. I chose a storage unit where I could space the shelves close together, with shelves that are deep enough for my storage bins, and doors to hide the beads and keep out the light. All my bins of beads live in the top section of the cabinet, behind closed doors that hide the beads and keep out the light. I also made enough room there for a small stack of jewelry trays that I use for organizing current projects. There are drawers below that hold wire, tools, some findings, large spools of thread, and some bulk seed beads that I swear I am going to make into kits someday. The things I use all the time are in a small 3-drawer chest next to the chair where I do most of my beading. So that chest is where you'll find the needles, thread on bobbins, most common tools, most used findings, and (usually) a small stack of jewelry trays on top with the current project. I took the cover off the big magnifier so you could see my work area. This area and storage works pretty well for me. I love having the beads close to where I am working, instead of having to go to the basement when I didn't have some color I wanted with me in the living room! We're living in a rental townhouse at the moment, and we're feeling a little displaced from our usual spread-out house life. I'm glad to have my beads so handy. I do admit to having boxes of additional stuff in the garage, but the only beads out there are one shoebox of old jewelry to be recycled into new projects and a larger plastic box (the size you might keep sweaters in) full of stuff from teaching beading to kids. It takes time to work out a bead storage system that works for your stuff and your life. And both of those things have a tendency to change. So I'm not inclined to spend a lot on say, bead containers. You might only need 100 of them now, but how many will you need in 3 years? Will you have the space for them?